Best Dive Sites in the World ... That I've Been To! I love diving! Its as simple as that…Ever since I was a little kid I’ve be a regular water baby and when I first tried scuba diving I was hooked! Seriously one turtle on my first dive (visiting our ‘sandy’ classroom!) and I knew it was better under the sea! Since the I have been lucky enough to visit many of the Best Dive Sites in the World and while I have a long way to go, here is where I have been so far! As they say, there is no such thing as a bad dive. Which is true as long as you choose a good operator! My first time diving. I completed both my open water and advanced with Ricardo from Hawaii Eco-Divers as well as a few fun wreck dives. Super chill but safe team and had only 2 in my class, which was taught all at the beach! So I never had to dive in a pool or some dirty old lake as many of my friends have had to! Turtles, big fish and bright anemones abound here, and some crazy huge WW2 wrecks which have since become a magnet for wildlife. Click through to find why Oahu is the best island to visit in Hawaii for first time, or go here to find the best accomodation deals in Oahu. Diving in Iceland is not the first thing that comes to mind when planning a trip there, but it should be top of the list. 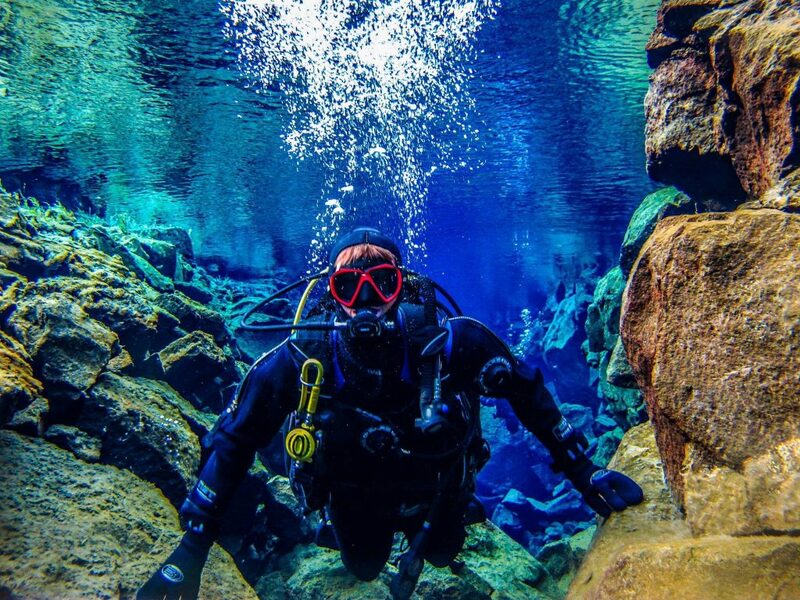 Silfra is a deep gorge filled with crystal clear glacial ice melt. It’s the clearest water in the water and the visibility is like nothing you have ever seen. You can see all the way to the gorge walls in all directions. Oh and those gorge walls? Actually two different continents (Europe and North America) so when it narrows be sure to push them a little further apart. It’s just above freezing so a dry suit is a must but it’s 100% worth it! Click through find the best accomodation deals in Reykjavík, Iceland. My first real experience of intensive diving. 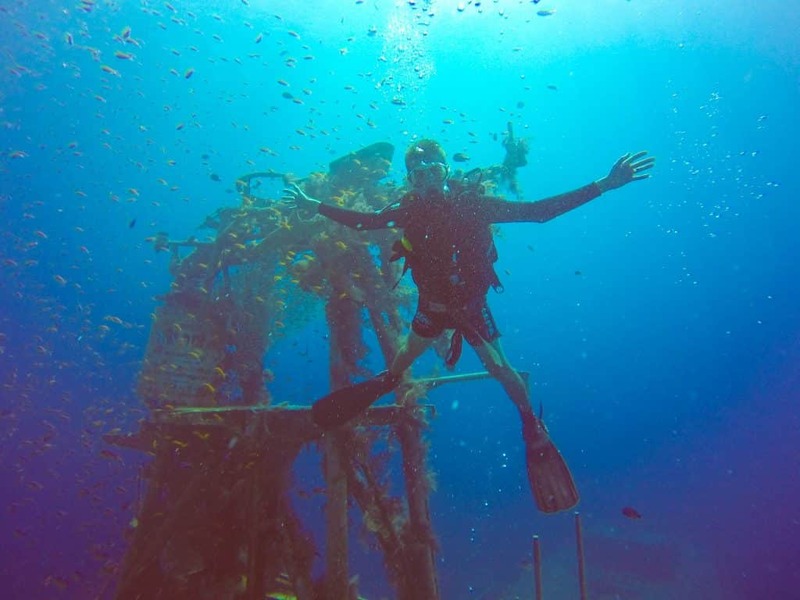 Wicked Diving offers a 6 day live-aboard to untouched Thai Islands, these are not your ruined Ko Samui and Ko Tao. They are absolutely pristine and filled with tropical fish, mantas and whale sharks! Amazing to live diving – as we said Eat, Sleep, Dive, Repeat. The Wicked team is highly professional and I would recommend them in a heartbeat. 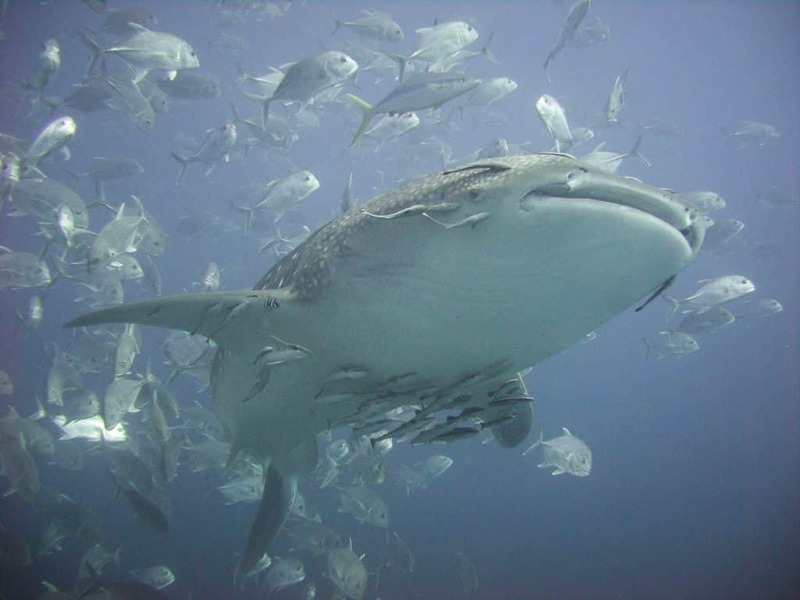 And if you go…Say Hi to Wilhelmina the Whale Shark for me! Click through to discover the best hotel deals in Phuket or Bangkok. 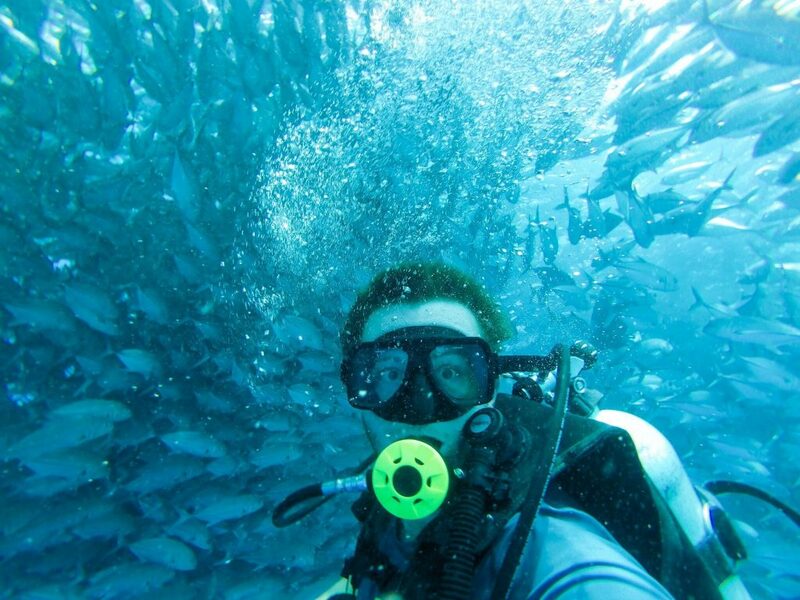 Chester from Action Adventure Divers is a one man band offering competitive prices for diving the Pitons in St. Lucia. 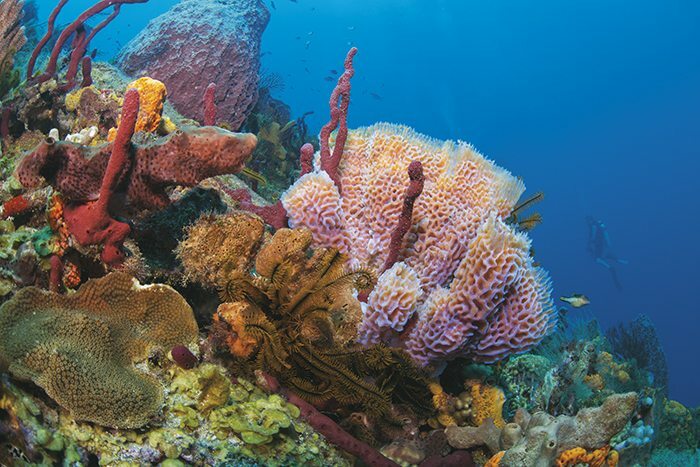 While the area is clearly over fished it does have some of the largest examples of sponge corals in the world. Seriously you can fit your whole body in them. Couple that with the incredible underwater geography of Fairyland and Superman’s Flight and your onto a winner! Also don’t be put off by his site name AADivers.org – I checked and there is no alcoholics involved! Click through to discover the best hotel prices for Soufrière in Saint Lucia. My first dive in the cold frigid waters of New Zealand…but boy! Was I impressed! Joe from Yukon Dive helped me to experience the Poor Knights, one of Jacques Cousteau’s Top Ten Best Dive Sites in the World. Mind-blowing to see the level of diversity in my own backyard. Dolphins escorted our boat out, the dive site is protected and teaming with species I never imagined lived in New Zealand. Kelp Forests dominate here but the colours…WOW! Mind-blowing landscape and its a full day trip so they show you all around the islands which are otherwise inaccessible. Talk to them next time you are in the South Pacific! Click through to find the best accomodation deals for hotels on the Tutukaka Coastline in New Zealand. 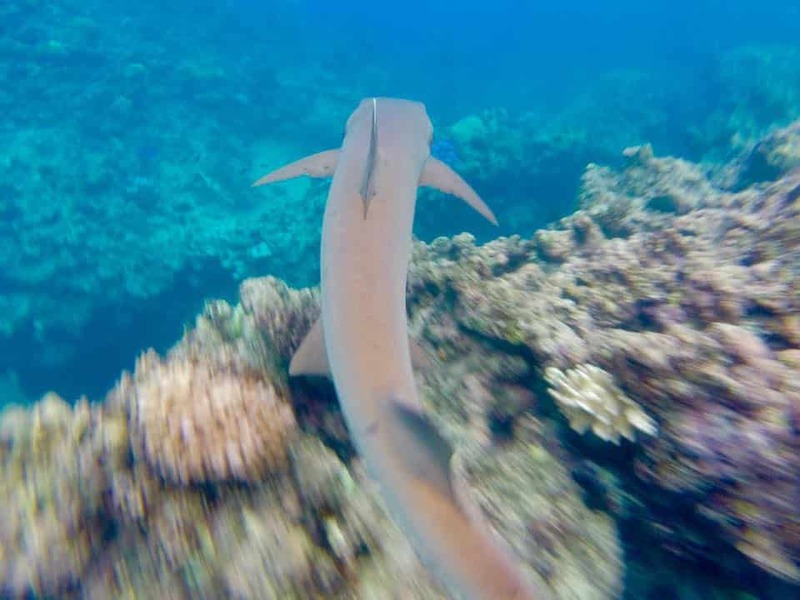 While exploring the Yasawa Islands with Awesome Adventures Fiji I had the privilege of being invited out by the crew at Mantaray Island Resort. The crystal clear, warm water was too tempting to pass up and we jetted out past golden coves and palm fringed islands to jump in. Beautiful abundant reef life with some chilled turtles and sharks to add to the magic, however this place (as the name suggests) is most famous for … MANTAS! I sadly was not hear in season but it is one of the best places in the world to snorkel with them when they are here. Check it out! Go here to find the best accomodation deals in Fiji’s Yasawa Islands. The Galápagos was an unexpected dive which I didn’t think I would have time for while on a G Adventures Galápagos Multisports Tour . Luckily I chatted to the guys at Galápagos Underwater and we were able to quickly change some snorkelling for diving at Kicker Rock. Seriously one of the Best Dive Sites in the World, hands down! One dive we descended through clouds of eagle rays to be joined by a curious sea-lion and another we sat clung to a rock while a school of hammer heads swarmed around us. I have never seen anything like it, the diversity here is insane due to the deep-water up-wellings here .. Do yourself a favour and book the next flight! 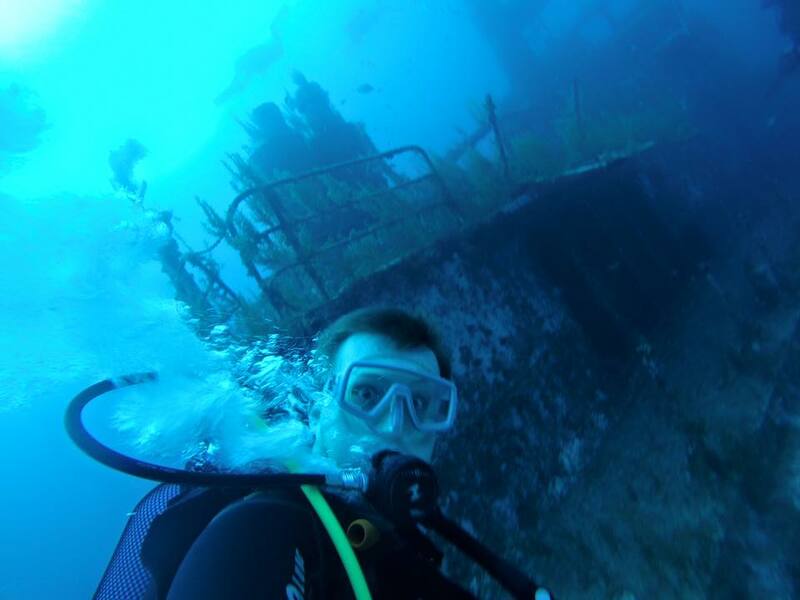 Oh and do more than two dives…I can’t wait to get back! If this is not in your budget you can also explore Isla de la Plata Ecuador as a alternative to the Galapagos, or go here to get an idea of the best accomodation deals in the Galapagos. While I’m not sure that there are even any Orca near Easter Island, Orca Dive Center is still the place to go here. There is nothing quite like dropping into the deep blue ocean on the most isolated island on earth. Here you will be rewarded by an other-worldly geography from this volcanic island, schooling fish and of-course…The Moai. Ok its not really but a fake one put down there for tourists but it makes an amazing shot and no one else has to know our little secret! Also while you are out there be sure to check out my Easter Island Travel Guide. 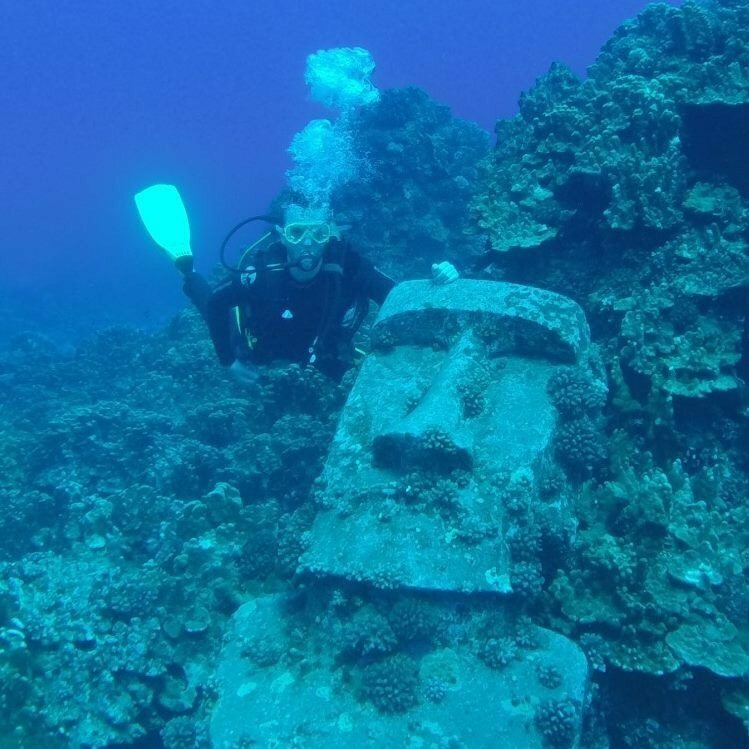 Click through to read about the Top Ten Things to Do in Easter Island Chile or go here to find the best accomodation options on Easter Island. I had a spare week in Europe and thought I want to do some diving. My friends said I was insane, it’s Europe, in winter! I was not deterred and after few words to Trevor at Dawn Diving I was booked. The water was pretty warm and there was plenty to see. Shallower reef, different rock formations, abundance of marine life and WW1-2 wrecks make the clear water of Malta on of the Best Dive Sites in the World. Dawn Diving was also the prefect partner here as they are the most safety conscious and professional operators I have ever dived with. Seriously! And on an island with as many dive options as Malta you need to be sure you are in good hands. Say Hi to the Madonna for me! Click through to find the best things to see in Malta above-water, or go here to find the best accomodation deals around Saint Paul’s Bay in Malta. 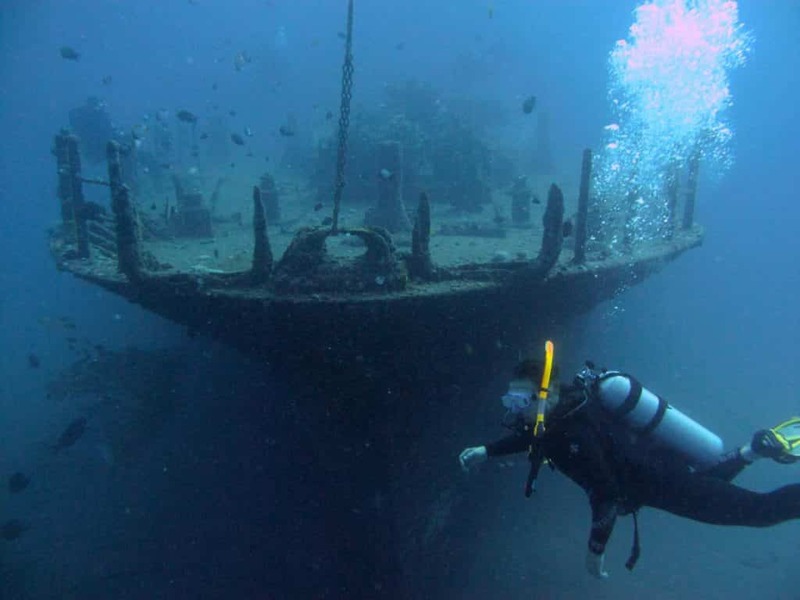 Tulamben in the northeast coast of Bali, facing the Lombok Strait, is famed for the USAT Liberty wreck which sunk in 1963. Tulamben Divers have a sterling reputation here and are the obvious choice, group sizes are kept down and safety is prioritized over profit. Depending on the season here you can also see mola-mola sunfish, hammerhead sharks and whale sharks. 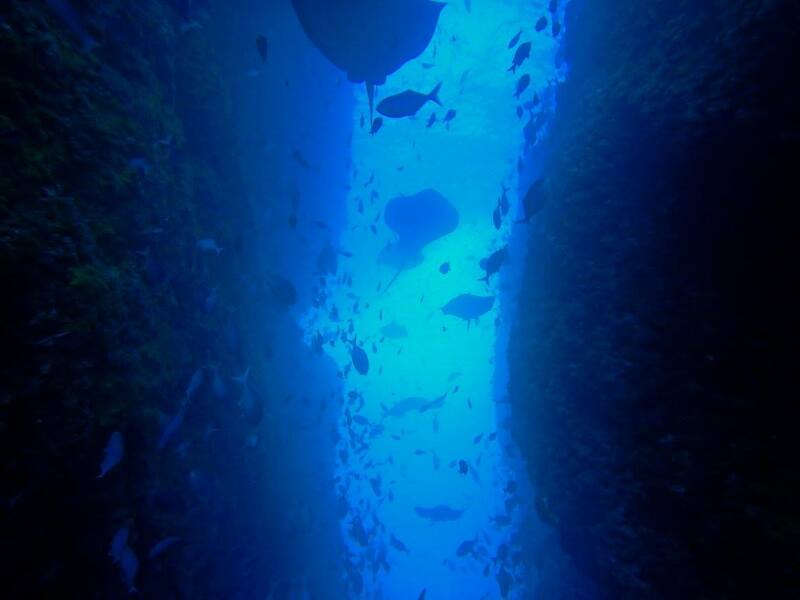 Serious, its biodiversity and location make Tulamben easily one of the Best Dive Sites in the World. 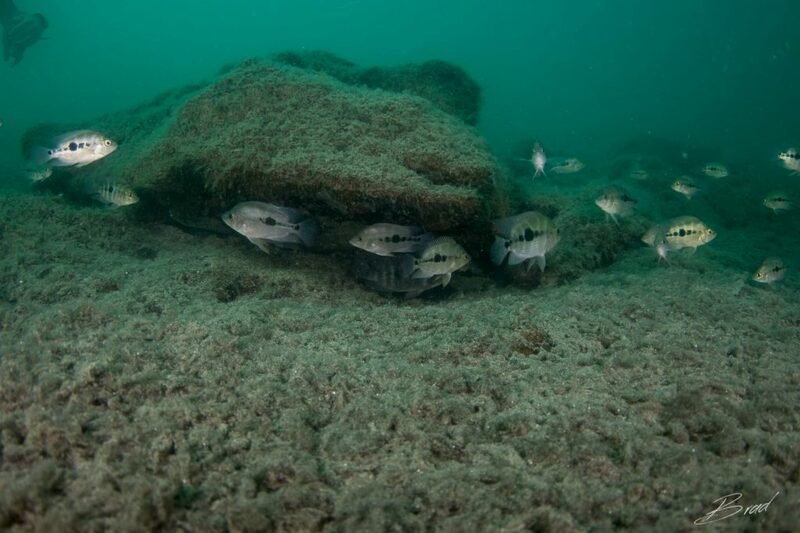 Also, if your up for it the wreck is also home to a group of bumphead parrot fish which you can only see at sunrise! Click through to read the 30 reasons you should be desperate to travel to Indonesia or go here to find the best hotel, villa and resort options in Bali! As if it wasn’t enough to come face to face with the prehistory past into Komodo National Park, you will soon realize even more amazing is what is under the water. Flores XP are the perfect guys to help you here, running a 3 day boat tour with camping on a private island, they have ample opportunities for diving with mythic land. As soon as you dip under the water you know its going to be good, shallow coral reefs, steep wall dives, drifting and more. You have every type of terrain and fauna here – You will not know where to look. Every dive is better than the last and the best of all is …The Mantas! Seriously. It was incredible and one of the biggest highlights of my life! 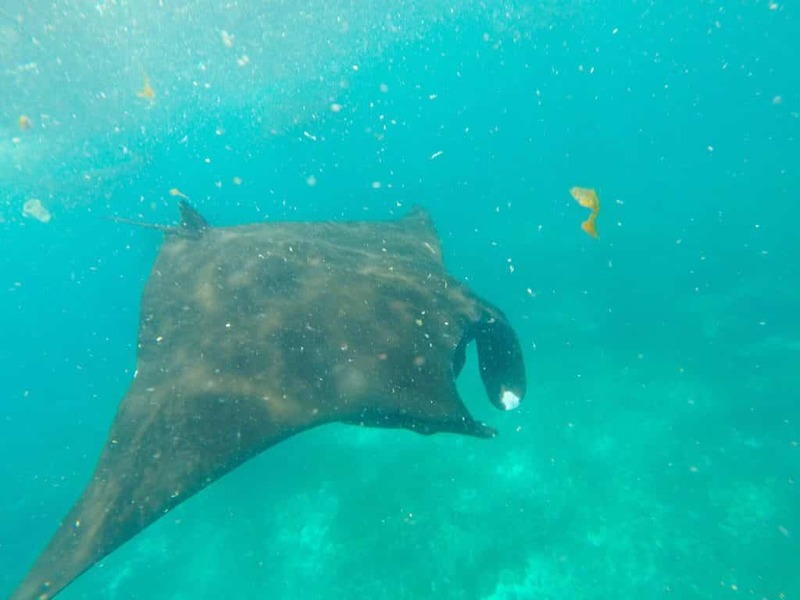 Click through to read more about my Komodo Island Manta Experience or go here to find the best hotel prices in Labuan Bajo. And of-course what list would be complete without Sipidan – One of Jacques Cousteau’s Top Ten Best Dive Sites in the World. 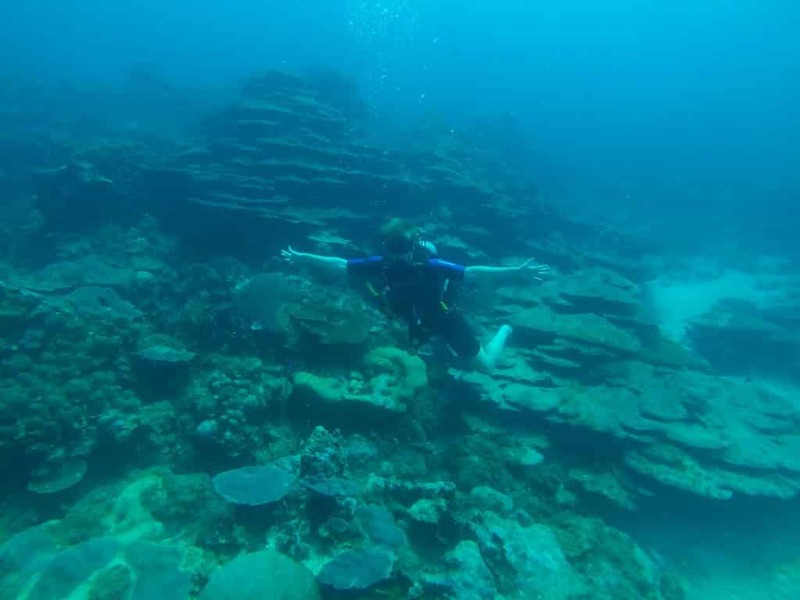 I do have to be honest here though, I would not recommend Billabong Scuba as they only do two dives at Sipidan while almost all other groups do three. If I were to return I would be talking to Scuba Junkie, they have much nicer accommodation and a better vibe. Either way, the diving here is sensational. We were in a tornado of Jackfish, saw more turtles than I could count and chilled with the sharks. Mabul also has some of the world’s best muck diving. Seriously, I saw everything down there. far too much to record but every place you looked at was teaming with new life. There really is nothing like it. Click through to read more about my complete guide to diving in Sipidan and Mabul or go here to find the best hotel and hosel prices in Mabul. Who would have guessed this tiny oil rich sultanate has some of the world’s most uncrowded beaches, rich coral reefs and pristine rain forests! 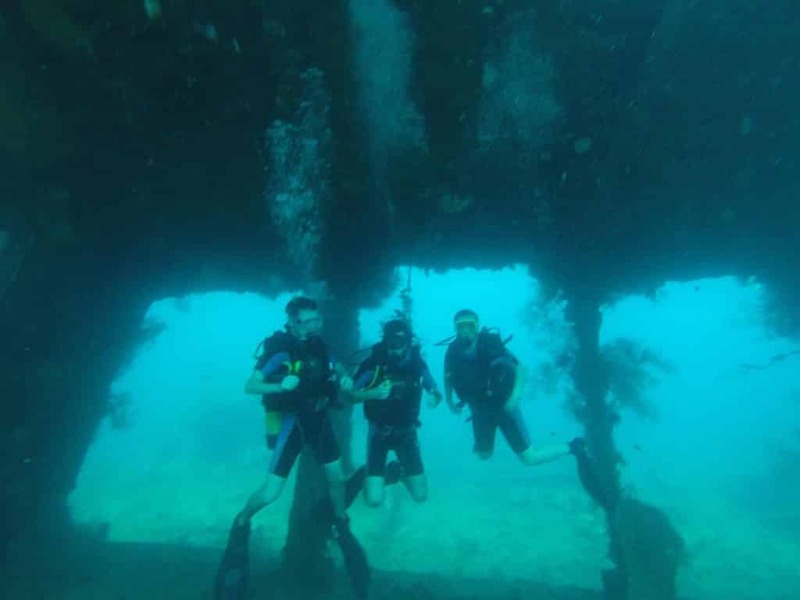 Oceanic Quest helped me explore the sheltered waters of Brunei Bay which have some of most interesting and accessible wreck dives in the region. Apart from the intrigue of exploring these rotting vessels, the wrecks also support a substantial marine ecosystem and you will see a ridiculous diverse variety of marine life. This is surprising for me given it’s distance to a major city but hey, thats what makes it one of the Best Dive Sites in the World. Talk to Oceanic Quest about the seasonal conditions before booking flights and be sure to stay at there super chill on-site accommodation. 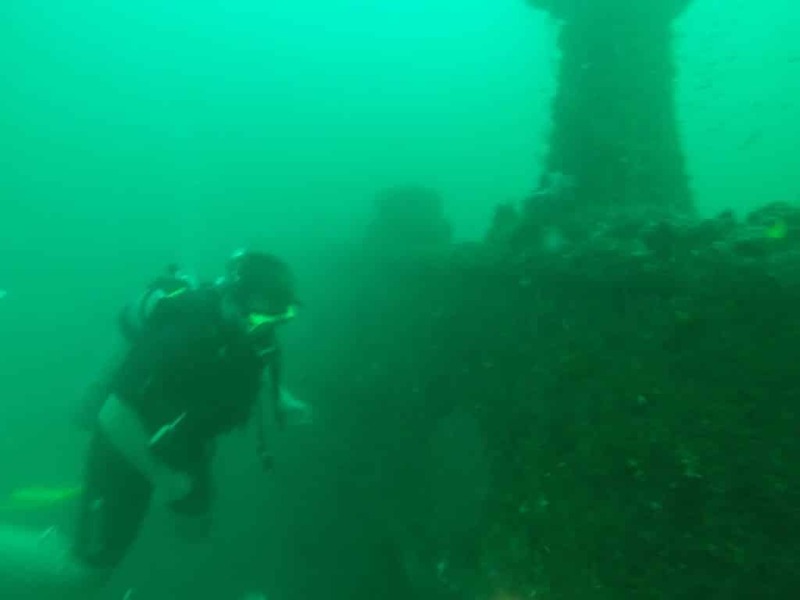 Click through to read more about diving in the Sultanate’s dark waters or go here to find the best hotel prices in Bandar Seri Begawan (Brunei). At the southern tip of Israel lies a few kilometres of sea-border providing a vital connection for Israel into the Red Sea and below. Famed as a holiday resort town, transportation hub and tax-free shopping this small strip of coastline allowed Israel access to the glorious diving of the Red Sea with spectacularly coloured coral reefs laying just meters off the shore. It’s rather surreal to immerse yourself with container ships passing by but trust me – when your under the water the diving here is the best diving in Israel. Wrecks, a crazy amount of macro-critter and schooling tropical fish await you with incredible visibility and warm water. Not only that but diving in Israel is incredibly well regulated, comparatively priced and very safe making learning to dive in Israel a very tempting proposition. Click through to read more about my Eilat Diving Experience or go here to find the best hotel prices in Eilat. While the historic old city of Cartagena might be more famous for its white sand beaches, colourful street, hectic markets and pirates it actually has some pretty special diving accessible only one hour off shore, making it an ideal place for beginners who are on short trips and just want to get their first taste of the big deep blue! 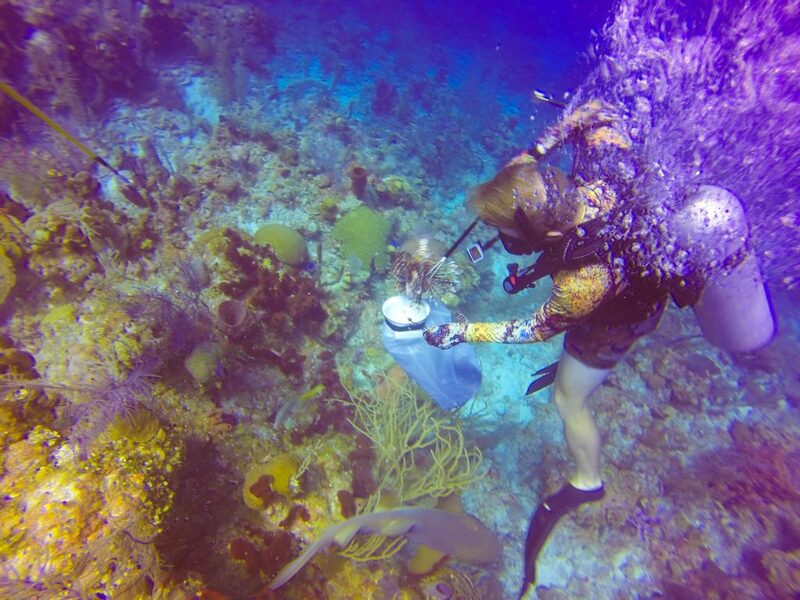 A taste of the Caribbean – don’t expect to see anything too big here but on first decent you will be greeted with bright blue water, schools of sparkling fishes and weird, other-worldly coral formations. The smurf diving site is one of the most bizarre with menacing mushroom shaped corals with red snapper with big eyes hiding beneath and plenty of other micro-goodies hiding in the cracks. 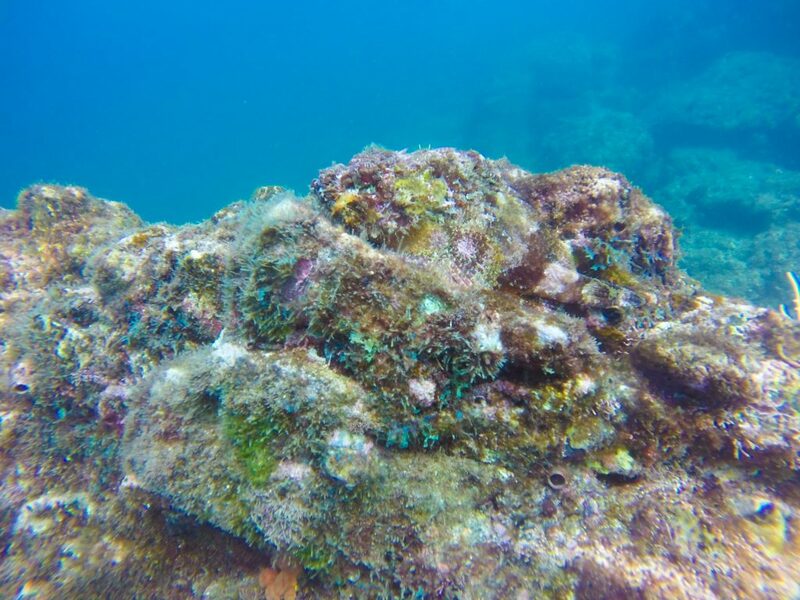 Scuba Diving in Cartagena is generally at a pretty shallow depth meaning bright colours, longer bottom times and great for newbies or those who haven’t dived in a while. Click through to read more about my Cartagena Diving Experience or go here to find the best hotel and hostel prices in Cartagena. One for those who truly love to get well, well off the beaten track – scuba diving in Capurgana and Sapzurro (right on the border of Panama and only accessibly but boat) offers something for everyone, a macro-lovers paradise, corals, deep divers, schooling fish, sharks and more! Most people come here to catch the boat to Panama via the San Blas Islands but it is worth it to take a few days here some of the cheapest diving in South America and since it’s so isolated you often dive with only 1 or 2. 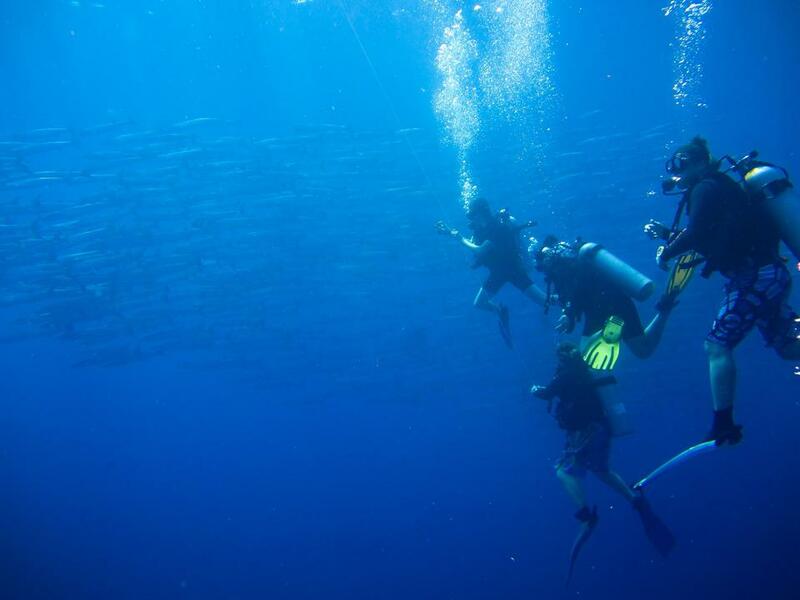 Barracuda, schooling snappers and giant nurse sharks were just some of the highlights but if you can choose what season you go here it can really help as when the weather rolls in the bright blue Caribbean disappears and visibility can drop to only a few meters in a day. Still diving in Capurgana is an enticing proposition and if nothing else will get you respect for and a story you can be sure most other divers have never heard of! Click through to read more about going from Colombia to Panama via the San Blas Islands or go here to find the best accomodation deals in Capurgana. Scuba Diving In Panama is surprisingly off most people’s radar as the ly opt instead to explore the metropolis of Panama City by just a few hours by car away on the Pacific Coast is Coiba National Park. 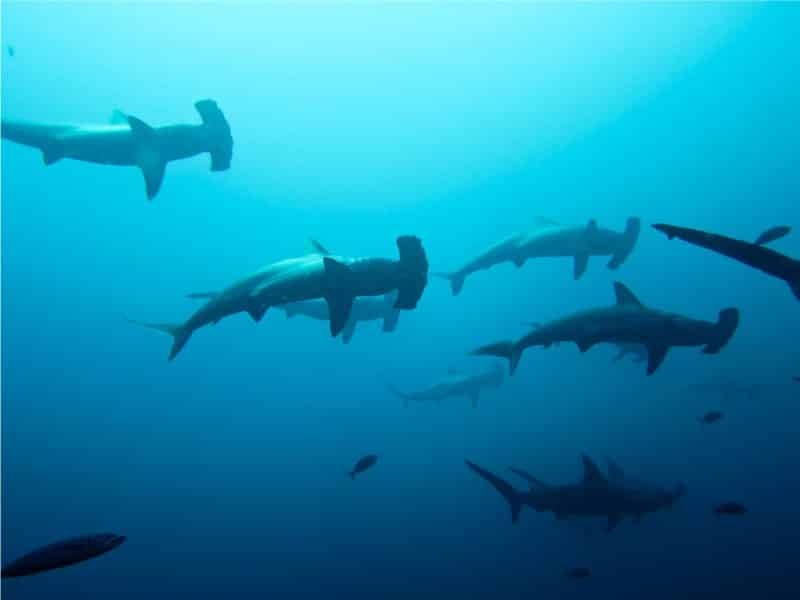 Often called the Galapagos of Central America, and part of the same island chain, Coiba National Park actually consists of the main Coiba Island and 38 smaller islands and barren rocks, and thanks for the strong upwellings from the deep ocean here Coiba is a dream for big pelagic species – mantas, dolphins, sharks, rays, turtles… and yes, even whale sharks are all common here. Visibility is best outside of the wet season, but when I went it wasn’t great and I was still blown away by the quality of diving at Coiba Island. Schools of fish counted in the thousands, sting rays the size of a small car, nudies, hundreds of nurse sharks, frog fish – pretty much the who’s who’s of a great dive site all make an appearance and ensure every trip to Coiba will be unique. A key ecological link to the tropical eastern Pacific for the transit and survival of pelagic fish and marine mammals, Coiba National Park is a UNESCO World Heritage Site and can be seen on a day trip stay in Santa Catalina or on a multi-day overnight trip which I review in full here (and you can find out more about Coiba’s resident salt water crocodile!). A true diving Mecca not yet ruined by its own fame! 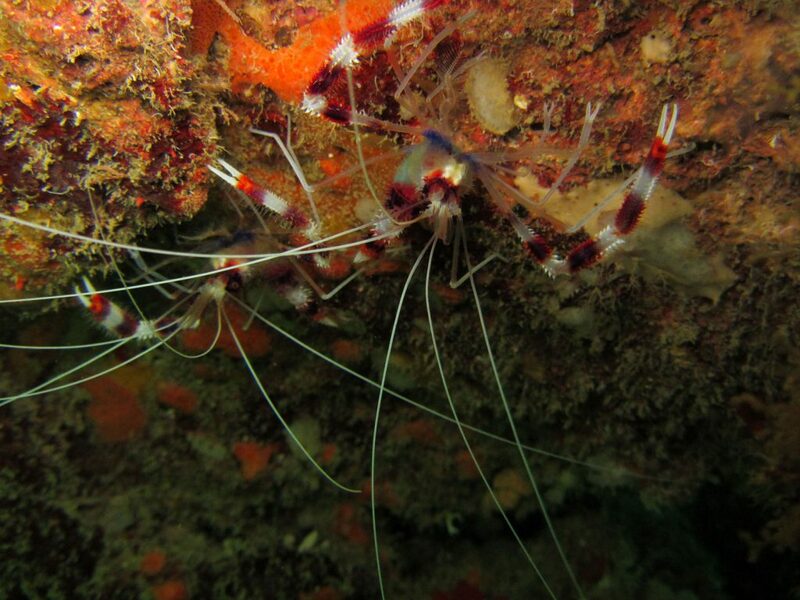 Click through to read the full Panama Dive Centre Review or go here to find the best hotel and hostel prices in Santa Catalina. Click through to read How To Dive In A Volcano And Help Save The World or to see the top 15 things to do in Granada Nicaragua. You can also find the best prices for hotels in Granada here. The most famous dive site in Belize might be the over-priced and over-rated Blue Hole dive but Turneffe Atoll is quite possibly the best. 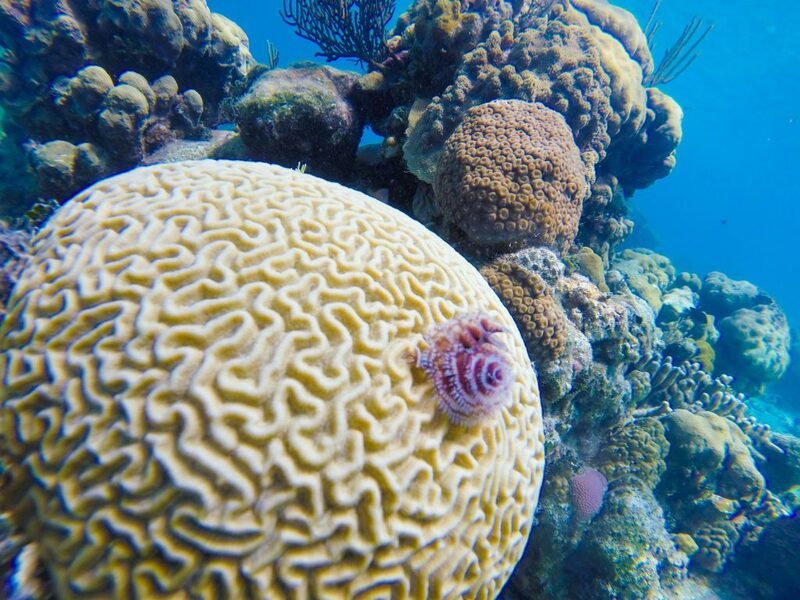 Easily accessed in a one hour boat trip from Cay Caulker Dense schools of fish, dramatic soft corals and a stunning wall dive all explain why this site is including in the Belize Barrier Reef UNESCO Site. Multiple sites add a lot of variety to each dive but the strong currents make this suitable for only advanced divers. With incredible water visibility and warm water you can expect to see plenty of rays, sharks and turtles – this is one dive site you do not want to miss! Click through to to find the best hotel and hostel prices in Caye Caulker Belize. The Riviera Maya in Mexico is known for the best cenotes, cavern and cave diving in the world. 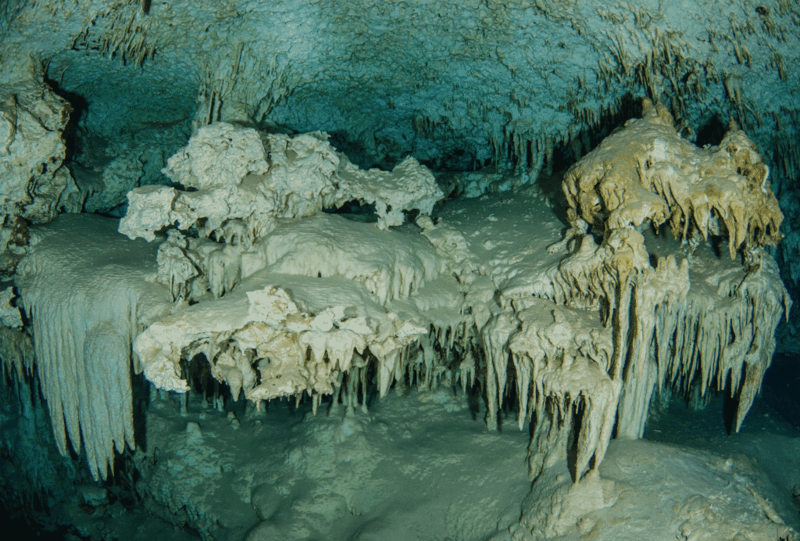 An experience of a life-time that takes you through pristine, blue waters underground to admire stalagmites, stalagmites and columns and explore what the Mayan’s believed was the entrance to the underworld. Having dived all over the world I was apprehensive to say the least about the quality of diving I would get in the touristy town of Tulum and at the Tulum Cenotes, but as soon as I saw first cenote (seh-NOH-tay) all my suspicions washed away as my experienced guide Joe from MexiDivers introduced me to these wonders of the world. Diving the cenotes in Tulum is one experience you absolutely do not want to miss if you are a scuba diver, and I promise you will be addicted and begging for more. Click through to read more about cenote diving in Tulum or the top things to see and do in Tulum. Alternatively you can skip these and just find the best hotel prices in Tulum here. While the beach-side resort town of Puerto Vallarta may be more famous for luxury hotels and it’s nightlife scene but just off those golden shores lies the Bahia de Banderas and the underwater preserve of Los Arcos. Los Arcos offers a a cluster of jagged islands with interesting under-water rock formations and plenty of sea life including schooling fish, octopuses, rays, turtles and more – all just 5-10 minutes from the beachfront resorts. Further off shore lies the world-famous Marietas Islands with it’s stunning coral reefs and volcanic rock formations. This is the domain of big pelagic fish, think whale sharks and manta rays, however they are notoriously unpredictable and seasonal. Due to the international jet set clientele here – and wealthy visitors from nearby metropolis of Guadalajara – prices here are higher than the rest of Mexico but still a comparative bargain compared to Cancun, and with far more on offer! Click through to find the best deals for hotels in Puerto Vallarta now. Click through to check out the hotel prices available in Playa Larga Cuba now! hotel prices available in Playa Larga Cuba now! 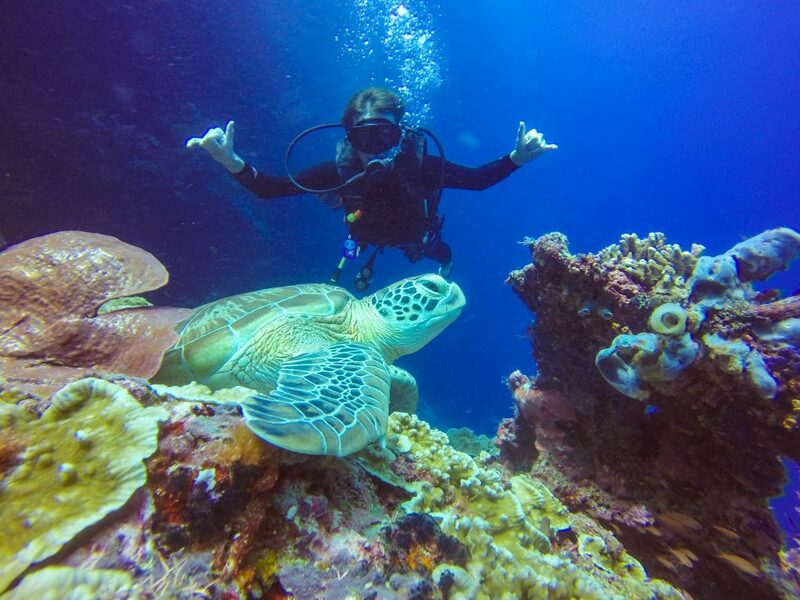 And there you have it, the Best Dive Sites in the World … That I’ve Been To! I obviously still have an entire ocean to explore (not to mention freshwater sites) so will continue to update this as I go. Please comment your favourite dive sites or opinions. 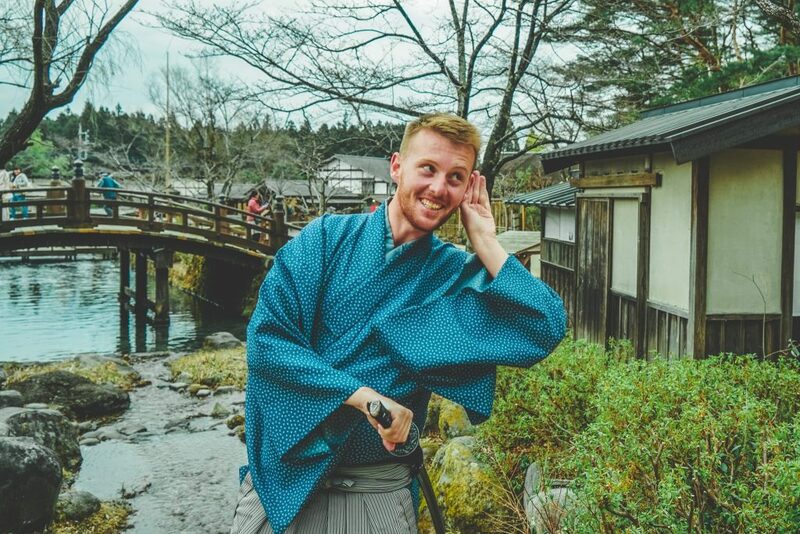 I know every diver has their own and I’d love to hear from you!